There are many types of orthopedic pillows that are designed to accomplish various effects by improving your body positioning. One such pillow is the cervical pillow. These pillows are specifically designed to keep your head and neck in a proper position while sleeping on your back or side. This is meant to reduce some common ailments including snoring, sleep apnea, and neck & shoulder pain. One function of the cervical neck pillow is to keep the head and neck in alignment so the airways stay open. This can help reduce snoring because snoring is often caused by restrictions in the airway. Another affliction related to restricted breathing is sleep apnea. Mild cases of sleep apnea can sometimes be treated using these pillows, but it’s important to get proper testing to determine if you really have sleep apnea, and to what degree. It’s not recommended that you self diagnose this disease. 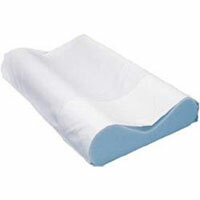 Cervical pillows are also used to reduce back and neck pain. Oftentimes normal pillows are too soft, and your head will rest in a very unnatural position when sleeping as a result. On the other hand, an over correction is caused when you purchase a pillow that is too hard and you’re merely forcing the neck in an unnatural position in the opposite direction. In either case, this can cause prolonged neck and shoulder pain. Cervical support pillows are designed to follow the contours of your neck and upper shoulders so that whether you’re sleeping on your back or your side, your head and neck are always in the most comfortable and natural position. This will reduce the strain that can often be the root cause of a lot of neck and shoulder pain. Whether you’re suffering from snoring, sleep apnea, or pain in your upper shoulders and neck, it’s important to consult your doctor before proceeding with any type of self “medication.” While a cervical pillow may provide short-term relief, there might be deeper causes of your pain or airway issues that need to be addressed.